Earlier I wondered - Do window insulation films reduce heat loss in winter? That post links to a bunch of videos talking about using plastic films or other layers of plastic to sorta mimic multi-pane windows. The best insulated windows are apparently ones with multiple layers (multi-pane), but if you&apos;re like me and have a landlord it&apos;s not possible to swap out your single-pane windows for better ones. Maybe adding a sheet of plastic will add a good enough air layer to create some insulation effect. Maybe. I want a great and objective way to measure actual temperatures and see what the actual benefit is. If any. There are thermal imaging camera&apos;s that provide a great way to visualize heat loss, but those cameras are rather eye-popping expensive. I instead bought a handheld IR thermometer and am finding it to be pretty darn useful. Those cameras cost on about $50 rather than the $1500 or more for the thermal imaging camera&apos;s.
Here&apos;s the thermometer I bought. It&apos;s compact and easy to hold in the hand, and pretty much trivial to learn to use. It uses a normal 9V battery. There&apos;s a trigger that falls conveniently under the index finger. Pay attention to the bright yellow warning sticker. These gizmo&apos;s have a laser on-board, and can damage your eyes so don&apos;t stare into the front while it&apos;s operating. Don&apos;t point it at your friends eyes. Don&apos;t remove the sticker and then forget about the danger warnings. 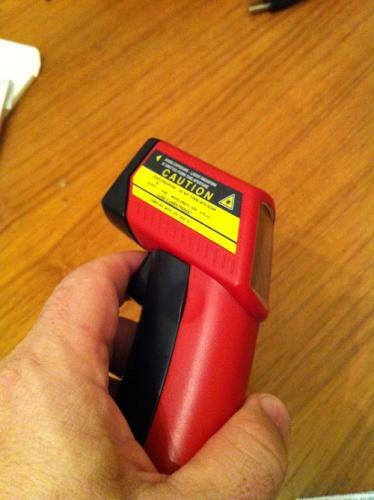 To measure a temperature, point it at something and press the trigger. After a couple seconds the temperature pops up. Want to get alarmed? Measure the temperature of an incandescent light bulb. Amazing. Anyway, it&apos;s real simple. 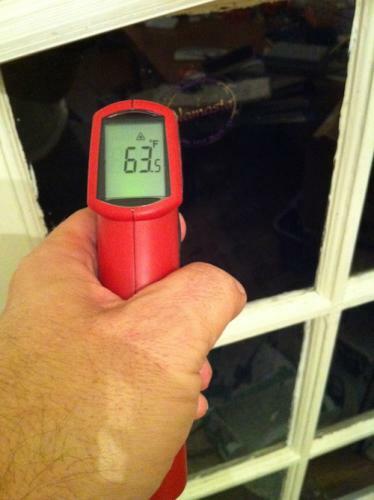 The point of this is to estimate the heat loss through windows. The way I approach this is to measure the temperature of the wall near the window, then measure the temperature of the window. 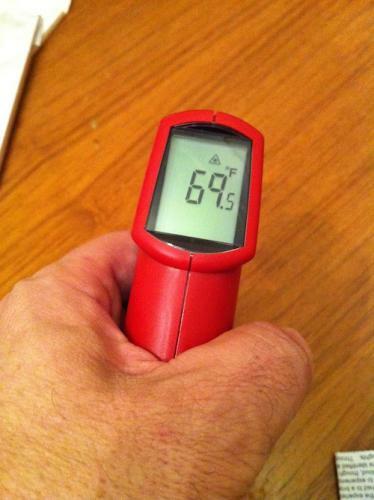 It might be interesting to measure the temperature of objects further inside the house. Here&apos;s my wall, measuring 68 degrees F. It&apos;s early December, in California, the outside temperature is in the 50&apos;s.
Here&apos;s a door-mounted window right next to the above wall. Temperature is 63 degrees F.
According to the weather service the outside temperature is 58 degrees F, so the window is about halfway between inside and outside temperatures. The closeness of those temperatures indicates heat being lost through the window. That&apos;s how one estimates heat loss through a window. Of course this doesn&apos;t provide a precise calculation of heat loss, but it&apos;s good enough for typical people to have a good sense of where their heat is being lost. What about pipes? I don&apos;t have any pipes in my house, and cannot show pictures of the process. In this case heat loss occurs through cracks in heat pipes. The question is, how to find those cracks and measure the temperature variations. 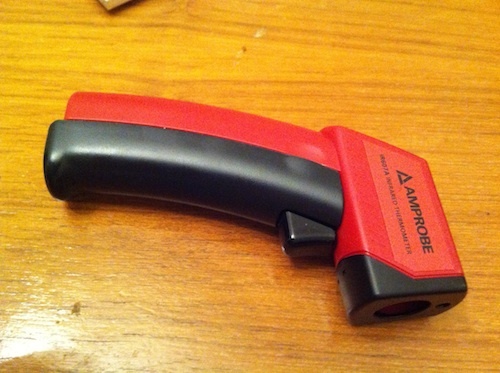 Using the IR thermometer, a crack should show as a spot of higher temperature. I suppose the thing to do is visually inspect your pipes looking for likely cracks. 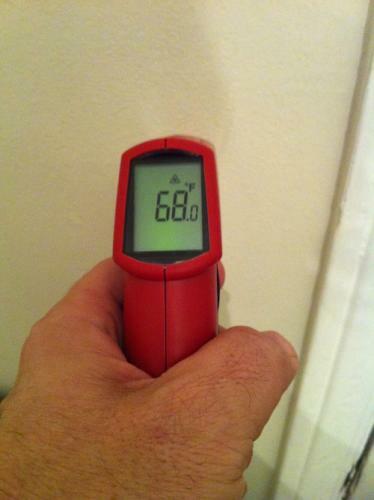 Then with the IR thermometer, measure temperatures to see if there is a crack. Of course, to estimate the effectiveness of adding plastic to a window - measure the temperature differences before and after adding the plastic sheets. I suggest doing multiple measurements before and afterward, to have a good understanding that you&apos;re making good measurements.